Raymond Marks is a normal boy, from a normal family, in a normal northern town. His dad left home after falling in love with a five-string banjo; his fun-hating grandma believes she should have married Jean-Paul Sartre. I first read The Wrong Boy when I was in my early teens, and I remember loving it. I remember thinking I'd never read a book so grown-up, yet so funny, in all my time. Picking this up again has brought rushes of nostalgia, and a realisation that maybe, just maybe, your ability to appreciate a really good book is something that can't be learned. The novel is comprised of letters written by Raymond to his hero, Morrissey. The letters detail his life so far, in a completely disjointed yet perfectly flowing narrative. Raymond's utter honesty, and his feelings surrounding the unfortunate circumstances of his life, are so heart-rending that the reader is drawn to him immediately. I'm sure in my younger days I could see myself being his friend; now, I just wanted to be his protector. Recounting the quandaries he's found himself in since the mere age of eleven, Raymond weaves a witty, open, and hilarious tale whilst still impressing the seriousness of themes such as mental health, family disputes, and remaining true to yourself. His words encapsulate his manic life incredibly well, as he describes everything with an entirely unique view, making us laugh hysterically along the way. Russell's intricate descriptions of Raymond create a difficulty in understanding that our protagonist isn't a real person, and he didn't write this book. I think that's one of the most heartbreaking things about coming to the end of the novel; turning to the back cover page, seeing Russell's author picture, and realising Raymond is only a figment of the imagination. 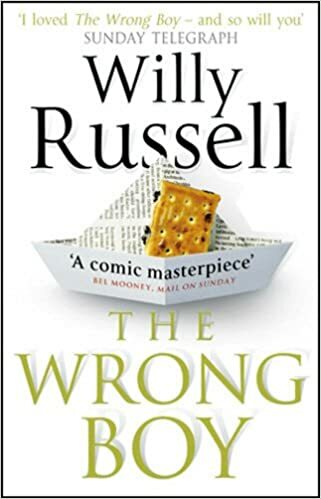 This is a mirror of some of things Raymond experienced throughout the pages, so Russell really has done a wonderful thing here. Although Raymond's characterisation was complex in its own right, each and every other character were given exactly the right amount of depth. Raymond wasn't shy in plastering his opinions of others across the pages of his notebook, and this worked wonders to help us understand their personalities, motives, and prejudices. Special mentions go to Gran, who was so amazingly unlike a standard old person, and a true beam of light amongst a cast of awful players, and Twinky and Norman who were the type of real best friends everyone needs - ones who support and encourage you, but who aren't perfect, and depend on the same treatment from you. It's difficult to describe exactly how and why this story is so wonderful, but it truly is something remarkable, and I don't feel this review does the story justice. I'm glad I decided to pick this up again after something like twelve years, and I know already it's a novel I'll come to back to many more times in life.